Updating your door handles is both a simple and effective way to update your home. But what do you need to consider to ensure that they are going to fit correctly to your doors? It is advisable to first remove your existing handles to establish the diameter of the hole, as the rose or backplate on your new handles will need to be large enough to conceal the hole and any existing fixing holes. You may also wish to consider the centre measurements, or the measurement between the fixing holes. This will enable you to use the existing screw holes to fit your handles, but is not an essential requirement for fitting your new handles. It is possible to fit new door handles to an existing latch, but you first need to check that the measurement of the spindle in your current handles matches that of the one included with your new handles. Should this measurement differ, then a new latch can be fitted. 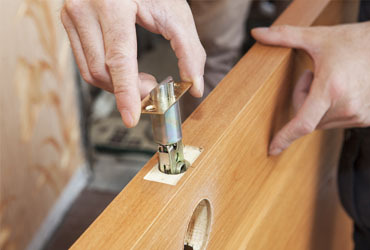 If you are planning to fit a new latch you need to take what is known as a 'backset' measurement. This is the measurement from the centre of the spindle hole to the edge of your door. It is important to ensure that your new door latch has the same backset measurement as the existing one, as this will determine the position of your handles on the door and therefore will ensure that the handles will cover the existing fixing holes. When ordering a new latch, you should also consider the dimensions of the face plate and strike plate included to ensure the new latch will cover any existing holes visible here too. For more information on updating your door hardware, why not check out our earlier blogs on Choosing Door Handles and Buying Door Latches.